For a refreshing iced tea drink, this iced oolong tea recipe is very simple to make and quite delicious to taste. Even though black pekoe is for many people the preferred choice for making iced tea, we’re sure you’ll love this refreshing change to oolong. This is especially true if you are in the market for a healthier choice than some of the more common sweetened iced teas. Iced beverages lose some of their sweetness when they are chilled. Keep this in mind when preparing this tea with naturally sweet oolong. You can always add a little bit of honey for a tea that suits your taste perfectly. 1 teaspoon oolong tea leaves. 1 or 2 cups of ice. Oolong teas vary significantly from one to another. Many oolong leaves have a fruity flavor while some have a more nutty essence with grainy notes. Which can make choosing the right one quite challenging, especially if your goal is a sweet iced tea. Most oolong varieties are delicious when served cold. But by all means, take the time to explore the many options. Oriental Beauty originated in Taiwan, which many tea fans claim remains the best area for oolong teas. Its oxidization level is quite high, about 70 percent, which means that from the moment the leaves are plucked the oxidation process begins. The result? 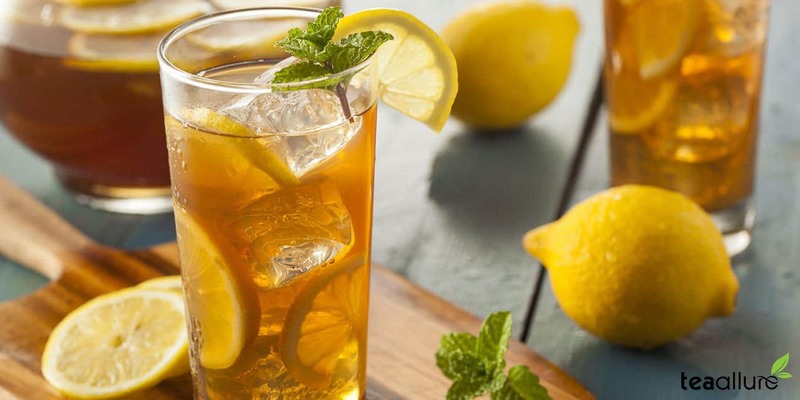 A beautifully sweet tea with a hint of sourness, enjoyed by tea lovers the world over. Tea enthusiasts think of Taiwan as the real home of oolong tea, so not surprisingly, the next recommended oolong variety hails from there as well. This naturally sweet oolong derives from Baozhong in the Wen Shan mountain region. It is a hugely popular oolong tea. This variety is hardly oxidized at all and has floral notes to add the enjoyment of this very smooth beverage. Some tea aficionados have reported that the tea leaves a delicious, creamy essence in their mouths after sipping. Pour the near boiling water over the oolong leaves. Steep for at least 4 minutes. One common mistake is to brew tea with water that is too hot. The result tends to be a bitter taste that might even require the addition of milk to make it more drinkable. Oolong is not an extremely delicate tea, and lands somewhere in the middle, between black and green teas, when it comes to brewing temperature. The water should never reach the boiling point, however, and should be around 195 F to achieve best results. Oolong should steep a bit longer than green tea. If you want hot tea, the recommendation is around 3 to 4 minutes. However, if you prefer iced tea like this recipe, steeping for 90 seconds is usually long enough. If you desire a bolder iced tea, just brew a few moments longer. Personal taste plays a prominent role in the taste of the final product. You should always adjust brewing times to suit your own unique preferences. At the end, enjoy this delicious iced oolong tea drink. Hi, my name is Abigail Bradley, founder of TeaAllure. Tea is my passion, and this blog is dedicated to provide all the information for this marvelous gift of nature.